I have to admit, I’d never thought about how versatile meringues are. When I received a review copy of the book Meringue Girls , I wondered: how many different recipes could there really be? It turns out, there are several. And, all of them are irresistibly pretty. The Meringue Girls, Alex Hoffler and Stacey O’Gorman, created a London-based shop that supplies these lovely treats for special events. Their meringues come in all sorts of shapes, sizes, colors, and flavors. It’s such a fun book with bright, cheery, pillowy meringues shown on page after page. The photos make you want to jump in and try several options. There’s a base recipe for meringue followed by suggestions for flavors and instructions for adding color and piping shapes. That recipe, in any flavor, can be used for all the various desserts shown in the book. There are filling and flavor options that can be mixed and matched for sandwiched, little meringue kisses like Lemon Curd mixed with poppy seeds and cream cheese placed between kisses that might be tinted yellow or Nutella Buttercream could sandwich chocolate kisses or maybe Green Tea kisses could be filled with chocolate ganache. Among the desserts and puddings, there’s Raspberry Ripple and Meringue Gelato made with broken kisses; a Pistachio and Rose Water Pavlova with Greek Yogurt, Honey, and Figs; and a Pretzel and Chocolate Marshmallow Meringue Tart to name a few. 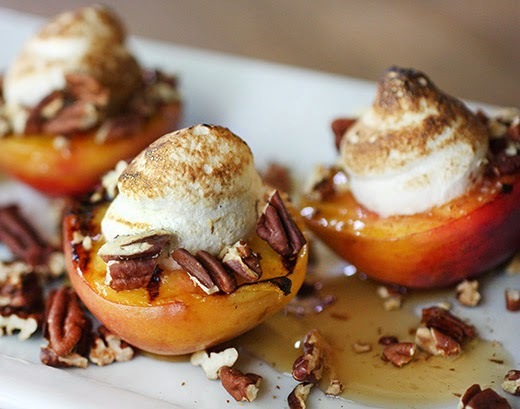 Since our Texas peaches are at the peak of their season, I had to try the Grilled Peaches with Maple Meringues. 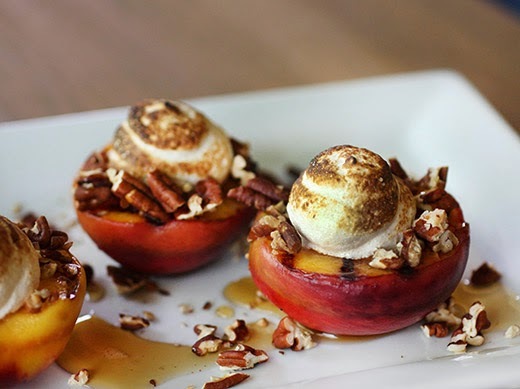 In the book, the halved, grilled peaches are sprinkled with crushed amaretti cookies before being topped with swirls of maple meringue that are browned. I opted for chopped toasted pecans instead of the cookies. For garnish, the peaches are drizzled with maple syrup. The maple meringue is made like an Italian meringue but heated maple syrup is used instead of sugar syrup. Maple syrup was heated to 235 degrees F before it was slowly poured into egg whites that had already been whisked to stiff peaks in a mixer bowl. The mixer was turned up to high, and the eggs and syrup whisked until the mixture was thick and shiny. Next, halved peaches were grilled, and I used a grill pan on the stovetop for these. I scooped the meringue into a piping bag to squeeze dollops onto each peach. I used a kitchen torch to brown the meringue, and I’ve realized the torch is the funnest tool there is in the kitchen. 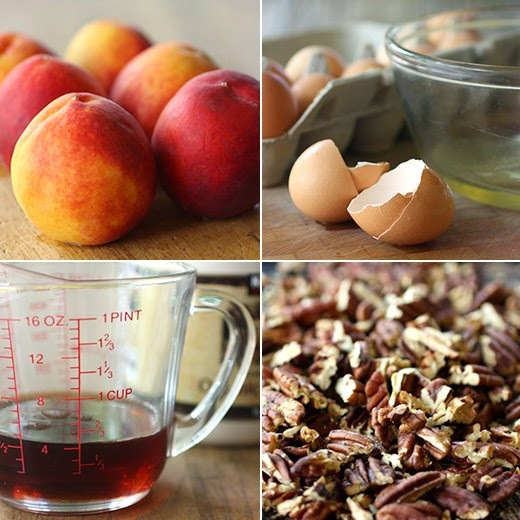 The peaches were transferred to a serving platter, I scattered chopped pecans all around and on top of them, and a little maple syrup was added to finish. The browned maple meringue dressed up the peach halves, and the maple flavor was a great match for the sweet fruit and crunchy pecans. This meringue doesn’t have to be baked, or torched, and another use for it is to fill doughnuts which I’d love to try. With all of these delicious ideas I’d never thought of before, I think I’ll be making meringues more often. Recipe reprinted with publisher’s permission from Meringue Girls . Our maple meringue has a lovely golden color and is absolutely delicious. Here, we use it dolloped on top of grilled peaches filled with crunchy amaretti cookies. For a super-summery dessert, try cooking the peaches on an outdoor grill. Preheat your oven to 350°F. Heat a large ovenproof grill pan over medium-high heat until hot. Place the peach halves cut-side down in the pan and cook without moving them until dark grill lines have formed, about 4 minutes. Turn the peach halves over, slide the pan into the oven, and cook until the peaches are just softened (but not falling apart), about 10 minutes. If you’ll be browning the meringue under the broiler, preheat the broiler. Fill the center of each peach half with crushed amaretti cookies and dollop maple meringue on top. Brown the meringue under the broiler or with a kitchen torch until golden. Carefully transfer the peaches to a serving platter or individual plates. Drizzle with maple syrup and serve right away. This maple meringue uses natural maple syrup instead of refined sugar. It's made like an Italian meringue—you heat the syrup to a high temperature and add it to the stiff egg whites. The earthy and rich maple flavor really comes through. The meringue doesn’t need to be baked, so it's perfect for our Maple Meringue Doughnuts. It also works really well in recipes for baked meringues (you can make kisses with it) or as a topping for waffles. You will need a candy thermometer for cooking the syrup. Put the maple syrup in a small heavy-bottomed saucepan and attach a candy thermometer to the pan. Place over medium heat. When the syrup approaches 220°F, begin whisking the egg whites on low speed in a stand mixer. When they’re frothy, increase the speed to high and beat until the whites hold stiff peaks. When the syrup has come up to 235°F, turn the mixer speed to medium and slowly stream in the hot maple syrup. Once you’ve added all the syrup, whisk on high speed until the meringue is thick and a little shiny; this will take 5 to 7 minutes. The meringue is now ready to use. Sometimes recipe ideas get stuck in my head. I see something that I know I want to try, and I carry the idea around in my thoughts for weeks or months until it happens. So it was with this bread. This idea came from the very first recipe in the book The Elements of Dessert that I read last year. It’s a book about desserts, but there’s also a section about bread baking at the beginning. Here, mini loaves were shaped into pain d’epi resembling stalks of wheat. And, not only were they made into pretty epi shapes, they were also made a lovely black color. This was a unique type of bread that I wasn’t going to forget anytime soon. 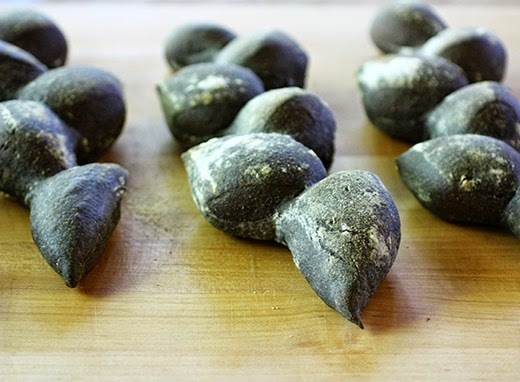 The bread dough was tinted with squid ink which doesn’t impart any noticeable squid flavor, but it does lend a deep, dark color. My plan was to steal the ideas for the loaf shape and the squid ink for color and use them with my favorite recipe for sourdough baguette dough from Nancy Silverton's Breads from the La Brea Bakery . This is where part II of the story begins. I’ve been reading a review copy of Dan Barber’s new book The Third Plate . There are so many things I want to share from this book that this blog post could end up scrolling indefinitely. I’ll try to limit my thoughts on it, but I highly recommend reading the whole book. Barber begins the book with a discussion about farmers who “grow nature” by maintaining a complete system rather than growing one thing. This speaks to an understanding of how everything in nature is connected, and that theme is repeated throughout the book in stories about very different parts of the food system. In particular, I want to share some of the story about wheat. Wheat doesn’t receive much attention in the realm of the sustainable food movement in comparison to fruits and vegetables, but it’s a significant crop. In the book, farmer Klaas Martens is quoted: “I see people go to all the trouble to visit the farmers’ market and really take the time to pick out the best peach, or stand in line for a grass-fed steak that’s treated the way a cow ought to be treated. And, then on the way home they buy packaged bread in the store.” We no longer seem to consider the flavor of grains or how they’re grown and processed. For instance, the process for making packaged whole wheat flour from the grocery store is a lot like that of making brown sugar. Brown sugar is refined white sugar to which some molasses has been added. Due to high-volume processing, it’s easier to make it that way than to change the process for a less-refined, true brown sugar. Likewise, whole wheat flour is refined white flour to which a little wheat germ has been added. I’m now inspired to seek out real, whole wheat flour made from the entire wheat kernel, and luckily, it’s available in Austin from Richardson Farms. That’s the whole wheat flour I used in this bread. I converted my sourdough starter to whole wheat by feeding it the whole wheat flour a few times before using it for this dough. The starter was combined with more of that whole wheat flour, some white bread flour, some added wheat germ, and water. After the initial mixing and autolyse, a little less salt than usual was added. Since I was adding squid ink which has a saline taste, I cut back a little on the salt. 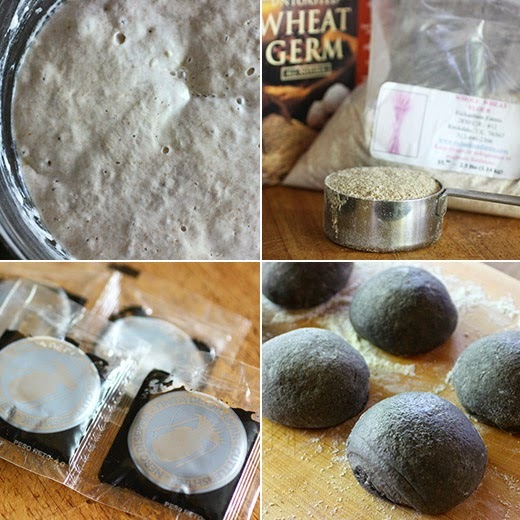 I started with three little packets of squid ink which tinted the dough dark grey. I really wanted a good, black color, so I added a fourth squid ink packet. While kneading, the color will rub off on your hands, but it washes off easily. The dough was left to ferment for about four hours. Then, I divided the dough into six smallish pieces and formed boules that were left to rest for 15 minutes. Each little boule was then formed into a small baguette, and they were left, covered in the refrigerator overnight. The next day, I cut each baguette into the pain d’epi shape before baking. It seems counterintuitive, but the cuts in the long, slender loaves should all be on the same side, spaced a few inches apart. That way, you can lift every other section between cuts and twist it to the opposite side to form the stalk of wheat shape. The loaves were baked in the usual manner with steam for the first 12 minutes and came out of the oven crispy on the surface and tender inside. I often eat with my eyes, and I was delighted with the look of this bread. But, the flavor was really the best part. I promise it doesn’t taste like squid bread. The squid ink really only lends some salinity. And, the whole wheat flavor was front and center. I’ll probably be mentioning more from the book The Third Plate because I can’t seem to stop talking about it lately. It offers great insight into areas of our food system that usually get overlooked or are often discussed in oversimplified terms. It’s gotten to be that time of year. It’s the season during which all I want to eat is ice cream. Ice cream or sorbet or granita for every meal would be fine with me. Luckily, I received a review copy of Jeni's Splendid Ice Cream Desserts so now I have some new options to keep my all-ice cream meals more varied. Here, you’ll find the same fabulous style of ice cream-making as that in Jeni Britton Bauer’s first book. There are unique flavor combinations, there’s some cream cheese in the ice cream base to give the texture more body, and there are also gluten-free, dairy-free, and vegan recipes. In this book, there are also cakes, tarts, biscuits, cookies, cream puffs, waffles, and empanadas. There are suggestions for sundaes and parfaits, ice cream bars, layered ice cream cakes, and even cocktails made complete with frozen treats. Last, you’ll find recipes for sauces and crunchy gravels, and of course, you can mix and match to create your own desserts. Let’s start with some of the ice cream flavors. The Cream Biscuits with Peach Jam Ice Cream has crumbled biscuits along with the jam mixed right into the ice cream. The Double-Toasted Coconut-Cajeta Ice Cream is suggested as a good option to make into a chocolate-dipped ice cream bar, and I’d love to try that. The sorbets have some lovely additions like sprigs of tarragon for the Grapefruit Sorbet and Jonesy old tawny port for the Melon Jonesy Sorbet. The desserts with multiple components include delicious-looking dishes like The Salty Grahama with Salty Vanilla Frozen Custard, Sliced banana, Whiskey Caramel Sauce, Salty Graham Gravel, and Whipped Cream; The Key Lime Parfait with Graham Cracker Ice Cream, Lime Curd, Chocolate Gravel, Whipped Cream, and a fresh cherry for garnish; and The Little Havana Cake with layers of Lady Cake, Guava Jam, Cajeta, Double-Toasted Coconut Ice Cream, Whipped Cream, and Meringues on top. Of all the tempting desserts, the first one I had to try was the Honeyed Buttermilk Ice Cream and the Kataifi Nests. 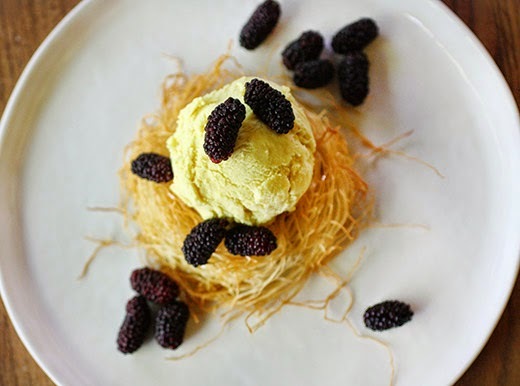 The Kataifi Nests are delicate, little serving containers just the right size for one nice scoop of any ice cream or sorbet. I thought they’d pair nicely with a honey-sweetened ice cream. To make the nests, a package of kataifi, which is shredded phyllo dough, was thawed. Then, you just take a handful of strands of dough, and wrap them around one hand forming a circle. Set the circle on a baking sheet setting the loose ends into the circle. There will be stray strands of dough here and there, and that’s just what you want. Once you’ve formed as many nests as you need, they’re baked at 375 degrees F for about 15 minutes until golden. When they come out of the oven, they’re brushed with melted butter mixed with honey and sprinkled with flaky sea salt. They can be stored at room temperature in an air-tight container for a few days. For the ice cream, honey and cream were heated and stirred until the honey melted. Buttermilk was added, and the mixture was brought to a boil. A cornstarch slurry was made with a little buttermilk, and that was added to the boiling buttermilk mixture. It was cooked while stirring until thickened. In a heat-proof bowl, some cream cheese had been combined with salt, turmeric, and a pinch of cayenne powder. The hot buttermilk was slowly whisked into the cream cheese mixture, and then it was left to cool. I chilled it in the refrigerator overnight before churning the ice cream. 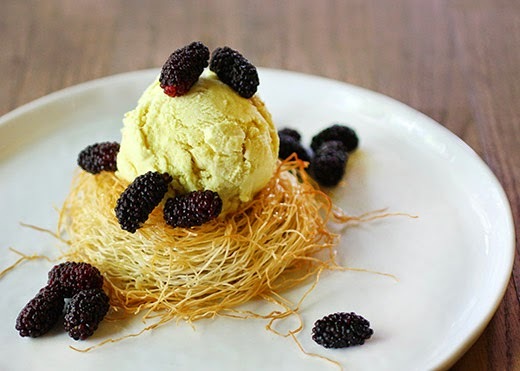 The sweet, salty, crunchy, honey-coated kataifi nests were ideal ice cream holders. And, the Honeyed-Buttermilk Ice Cream was just sweet enough and not too sweet with tanginess from the buttermilk. It was a lovely yellow color from the turmeric too. I topped the ice cream with some fresh, local mulberries. With all the other flavor options in this book and all the possibilities for embellishing them, I’ll have countless ways to satisfy my ice cream cravings. As soon as our weather warms up, I start thinking more and more about Greek food. Grilled souvlaki with tzatziki is a favorite; cucumber, tomato, olive, and feta salad with basil is a must, and so is watermelon with seared halloumi. Just in time for summer, I received a review copy of Smashing Plates: Greek Flavors Redefined by Maria Elia. I’m a big fan of her book The Modern Vegetarian , so I suspected there would be a lot to like about this new book. This time, the recipes aren’t entirely vegetarian, but many are and many others are adaptable to exclude meat. Elia set out to take Greek ingredients “on a new culinary journey.” The dishes in this book are familiar but with a new perspective. For instance, figs appear often in Greek cuisine, but the leaves aren’t used. Elia was inspired to incorporate fig leaves in different ways. There’s a recipe for fresh pasta made with dried fig leaves, and the pasta is served with Lemon and Oregano Roasted Tomatoes, fresh figs, and almonds. Also, there’s a Fig-Leaf Wrapped Feta dish that’s baked until the feta is softened. Another recipe that caught my eye was the Scallops, Soutzouki, and Watermelon dish that looks perfect for summer. I’d skip the sausage component, but the Raisin Oregano Dressing served with it sounds so intriguing. Then, I saw the Sardine Keftedes and headed straight to the kitchen. 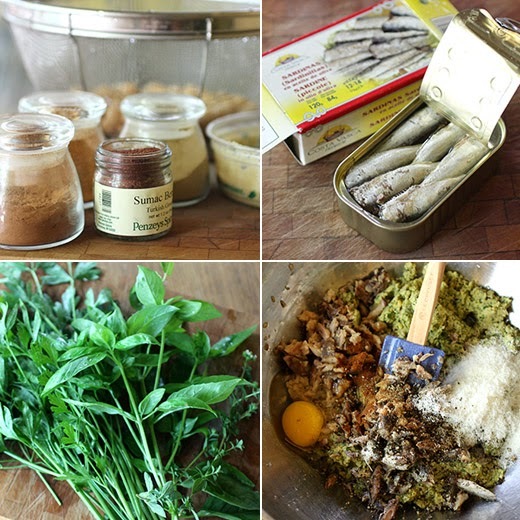 I still had a tin of sardines that I brought home from Spain, and this was a great use for it. 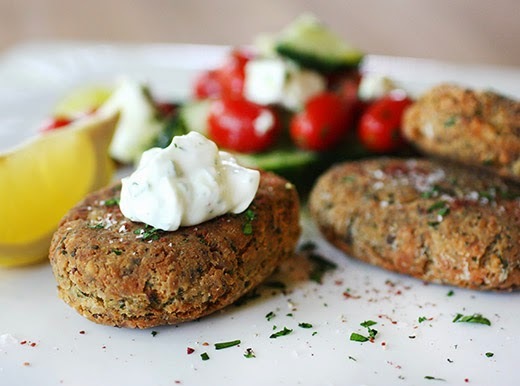 To make the keftedes, it’s actually about a half and half mix of chickpeas and sardines that are combined with bread crumbs and lots of great flavorings. The result is not too sardine-forward, and sardines are a great choice of sustainable seafood with healthy omega-3s. Rinsed and drained chickpeas from a can were added to the food processor with tahini and broken up a bit by pulsing. That was transferred to a mixing bowl. Depending on what kind of canned sardines you choose, you might need to remove the backbones. Once boneless, the sardines were broken into pieces and added to the chickpea mixture. 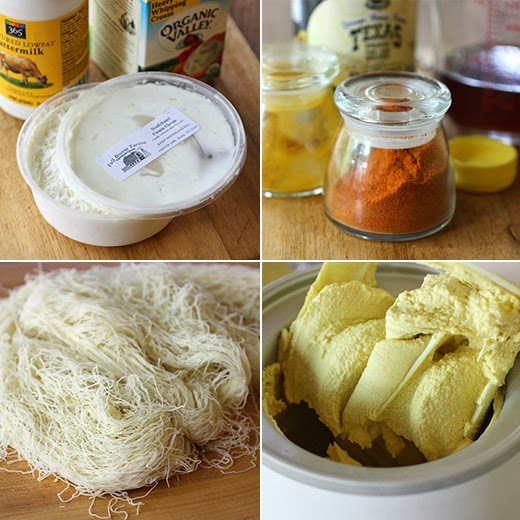 Kefalotyri cheese was to be used, but I wasn’t able to find it the day I needed it, so I used Myzithra. Parmesan or pecorino could also be substituted. The finely shredded cheese was added to the mix with a pinch of cinnamon, a little cumin, some paprika, an egg, and bread crumbs. I also used some parsley, oregano, and basil from my herb garden. Mint was suggested in the ingredient list, but I tend to skip mint and opt for basil. 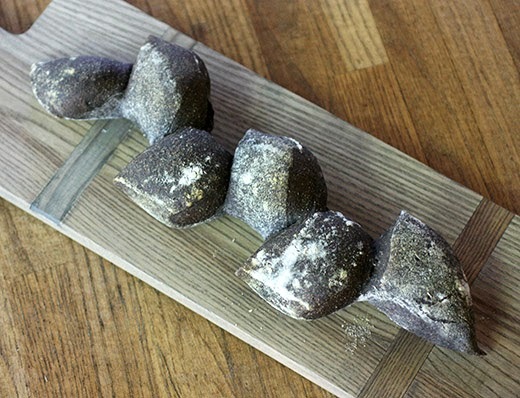 The mixture was divided into 12 portions and rolled into balls that were flattened, dusted with flour, and seared in olive oil until golden on each side. The keftedes were served with a sprinkling of sumac and lemon wedges for squeezing. 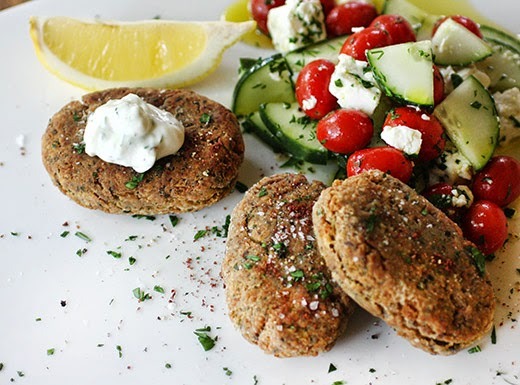 I topped them with yogurt mixed with fresh dill and added a cucumber, tomato, and feta salad on the side. The sprinkling of sumac added a bright, citrusy note. Elia suggests serving them in a sandwich with skordalia, tomatoes, and basil. I’ll try that next time. And, then I need to try several other dishes and spend some time with the sweets chapter. The Almond, Rose Water, and Chocolate Mallomar Chimneys might be next. Recipe reprinted with publisher's permission from Smashing Plates: Greek Flavors Redefined by Maria Elia is published by Kyle Books, priced $27.95. Photography by Jenny Zarins. These are great served cold in a sandwich with skordalia, vine-ripened tomatoes, and fresh basil—it adds a whole new meaning to a fish finger sandwich! I like to serve mine with Lemon Parsley Salad (page 147) and a little Skordalia (page 130), Taramasalata (page 129), or dill yogurt. Variations: Omit the Kefalotyri and add 1⁄3 cup of crumbled feta and 2 tablespoons of grated onion. Put the chickpeas, herbs, and tahini in a food processor and pulse until the chickpeas have broken up a little. Transfer to a bowl. Add the sardines, flaking them into pieces by hand, then the spices, cheese, egg, and some salt and pepper. Mix well, adding the bread crumbs to combine. Divide the mixture into 12 and roll into balls, dusting in the flour. Place on a baking sheet lined with parchment paper and refrigerate, uncovered, for a couple of hours to firm up. Heat a little olive oil in a frying pan over medium heat, slightly flatten the keftedes so they’ll cook evenly, and pan-fry until golden on each side (about 3 minutes per side). You could deep-fry if you prefer, at 325°F for 2–3 minutes, turning once. Drain on paper towels, sprinkle with salt and sumac, and serve immediately or at room temperature, with lemon wedges on the side, if you wish.